Tonight we went to a benefit show for 826 Valencia, a writing center started in San Francisco by writer Dave Eggers. It was a great show, with a bunch of my favorites – Grizzy Bear, Britt Daniel of Spoon, A.C. Newman, Feist, the two main dudes from Broken Social Scene, and Jim James of My Morning Jacket – competing for my overawed attention. 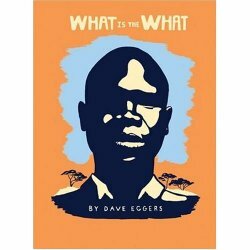 Coincidentally, I had just finished “What is the What,” a book by Dave Eggers. It’s a fantastic, devastating book about a Sudanese “Lost Boy” and how his life was torn apart, again and again, by the civil war in Sudan. Eggers wrote it after having many long talks with protagonist, Valentino Achak Deng, and it’s a kind of novelized memoir, fiction but based on Valentino’s real experiences. Anyway, it’s a transformative book, not only for the quality of the storytelling, but for for the way that Eggers was able to move beyond the meta-narrative conceit of his first novel, “A Heartbreaking Work of Staggering Genius,” toward a work of far greater emotional pull. The book has been a big part of my inner life for a couple of weeks – don’t you love how books do that? – and I was sad to see it go as I turned the last page. What does this have to do with watching a bunch of indie rockers? Both were brought to me by Dave Eggers, a guy who, when I still harbored dreams of being a fiction writer (a long story...) Eggers was public enemy #1. He was too cool. Too smart. Too aware of being cool and smart. Too aware of being aware of being cool and smart. I, along with my writerly friends, was jealous of him. He was young and hot and he'd turned a great personal tragedy into the first great novel of the 21st Century.We all read McSweeney's and loved the design, the inside jokes, the pithy online observations, the (realized) goal of creating a new community of literate and hip writers. After a while, the smarty-pantsness of it all started to wear on me, and I wanted something that, for lack of a better word, felt more "real." I got into reading war journalism. That's real! Joan Didon. Samantha Power. Policy and history that actually affected people on the outside, rather than making them feel good and white and all Park Slope-y on the inside. That's how it felt, anyway. So it was a great relief to read "What is the What" and to love it. And then to go tonight's show, which was bursting with the bespectacled McSweeney's crowd (like me!) and to love that, too. I'd come full circle. Maybe it was just the Grizzly Bear.